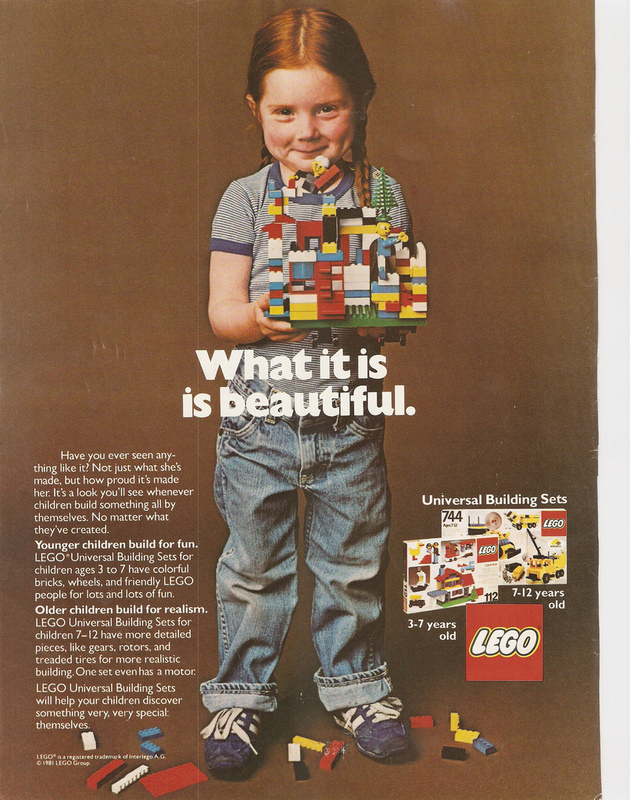 I think that one of the main reason why Lego catches a lot of flack is because they have been so good for so long, so people think that Lego are supposed to be the good guys, which is why this girl has become the poster girl of old and good lego. I read a real good and thorough article that puts the whole controversy in a historical perspective and has data to back things up. It turns out that even in the 80’s Lego already had it’s first forays into girl-branded Lego that was form over substance, but ever since there have been more and more forays of Lego into the field, most recently with the Lego Friends series, of which the hands can’t even rotate, so it is more like PlayMobil than Lego (and I have always detested PlayMobil with a passion). “One,” she said, in that “derp, obviously” tone. Then looked at the pieces needed for the step, snatched them up out of the right colored pile, and put them together. “Done, mom,” she said. This (and this exactly) is why Lego is such a great toy. It teaches children not only how to follow building instructions, but it also teaches them how to solve problems by breaking it apart in smaller steps. If, at a subsequent step, you discover that things don’t line up as they should have, you step back until you find the error, fix the error and go onwards again. This is exactly how problem solving works in the real world and it is a crucial skill for all educated jobs. I will not even go into how reinforcing negative stereotypes (like giving girls homemaker role models and boys military role models) is a negative thing (I think better role models would be aspirational role models like scientists, activists, etc, which is why I spent a lot of time building Greenpeace ships from my Lego pile), but all things being the same, there is no reason why girls would not be capable of building a more complex kit, and at least gain the learning experience that Lego can give you. To close this up, there are still a lot of people out there that build amazing things out of Lego. 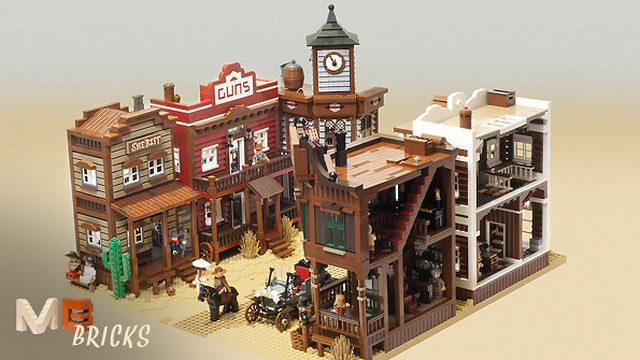 This western town got >10000 votes on CUUSOO, which means that it is now getting evaluated by Lego whether they will make an official kit out of it. The detailing of the models is excellent and it looks like great fun to play with. 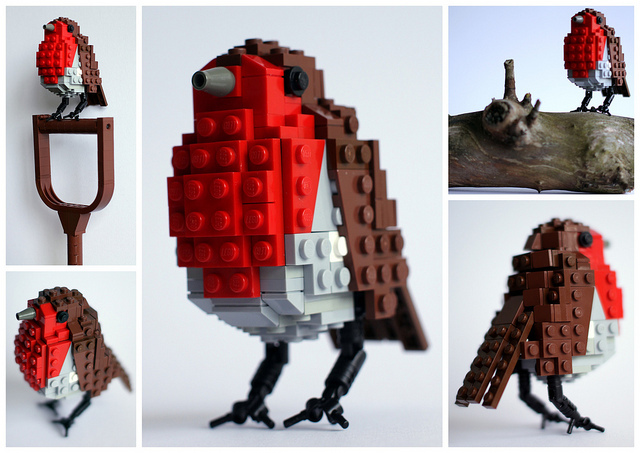 This robin is part of a bigger set of British birds. Unfortunately there are just some 1000 votes, so it doesn’t look like it will be made into an official set any time soon (and it is more decoration than toy), but it is still a really neat idea. I loved Legos too! My mother and her sister bought a giant box at a 1970’s garage sale and my brother and my cousins played with it for years (at least the bits that my youngest cousin didn’t eat). The older un-specialized blocks were always the best because you could build anything out of them. One thing that has struck me about the Lego For Girls kits is that the pieces are so specialized that you can’t use them for anything other than building the hair salon pictured on the box. Too bad.